June 21, 2010 -- Dr. Don Maness, dean of the Arkansas State University College of Education and a professor in the Teacher Educa tion Department, has authored the book, “Do They Miss Me at Home? : The Civil War letters of William McKnight of the Seventh Ohio Volunteer Cavalry." The book was published this spring by Ohio University Press. Maness, an avid Civil War enthusiast, co-edited the book with Jason Combs, an associate professor of geography at the University of Nebraska-Kearney, who has published a number of articles in refereed journals. Prior to his appointment at UNK, Combs was an assistant professor of geography at Arkansas State University from 2001-2007. 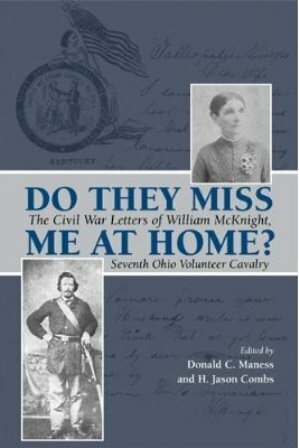 William McKnight, the subject of the book, was a member of the Seventh Ohio Volunteer Cavalry from September 1862 until his death in June, 1864. Capt. McKnight was killed in action near Cynthiana, Kentucky. During his time of service, McKnight, a blacksmith before the war, wrote dozens of emotion-filled letters, primarily to his wife Samaria, revealing the struggles of the family both before and during the war. After McKnight's death, Samaria was left a widow with six young children. She never remarried and mourned him for the rest of her life. The book contains more than one hundred letters, providing in-depth accounts of several battles in Kentucky and Tennessee, including the Knoxville and Cumberland Gap campaigns that were pivotal events in the western theater of the Civil War. It corrects previously-published claims regarding McKnight and Confederate Gen. John Hunt Morgan. While Morgan did stay for a period of time at McKnight's home in Langsville, Ohio, during the raid through that state, McKnight was in Kentucky at the time. Maness received access to the letters from McKnight's descendants. In the book's preface, Maness writes, "A letter dated September 14, 1863, from William McKnight to his wife Samaria describes General Ambrose Burnside's operation in eastern Tennessee and the Union action around the Cumberland Gap. Reading the letter, I was intrigued about the possibility of additional letters in the family's possession. Further inquiry elicited that there are well over one hundred letters in the McKnight collection." With the family's blessing, Maness was provided the opportunity to review, copy, and transcribe the letters, most of which were written on fibrous paper and folded in the original envelopes. Maness notes that during the Civil War, letters were among the few connections to home that soldiers had. Their importance increased as the war advanced and troops found themselves farther from family and friends. Along with the horror of battle, the men fought loneliness and homesickness. In one of his last letters to his wife before he was killed in action, McKnight says, "If I owned this whole State I would give it to be with you and the war at an end so that we might never be separated." One reviewer said of the book, "Ably edited in this timely collection, those letters make for interesting reading, sure to be welcomed by both amateur and professional historians of the Civil War." Another reviewer said the letters in the book by Maness, "remind us of the sacrifices that the war exacted from families as soldiers fought to protect their homes and country and shape the nation for future generations." Plans are being finalized for a book signing on the ASU campus when the fall semester begins in August. In June of 2009, following a national search, Arkansas State University-Jonesboro named Maness dean of the College of Education. He previously served as professor of American history and political sciences at Bartlesville Wesleyan College in Oklahoma from 1973 to 2001, and served as vice president for Academic Affairs at Oklahoma Wesleyan University in 1987. In 2001, Dr. Maness joined ASU-Jonesboro as associate dean of the College of Education and served as special assistant to the vice chancellor for Research and Academic Affairs in 2005-06. Maness completed his Ed.D. at Oklahoma State University with a double major in higher education administration and educational administration. He earned his M.A. in American history with a minor in political science from Michigan State University. He has presented numerous conference papers and presentations to learned forums, and he remains active in a variety of professional and creative endeavors. The book is available through the Ohio University Press and at Amazon.com. For further information, Maness (dmaness@astate.edu) can be reached at (870) 972-3057.